President Trump said the planes would now be grounded until Boeing "comes up with a solution". So I guess that must signal the end of the FAA as it is today. Even their ultimate boss is doing their job for them. 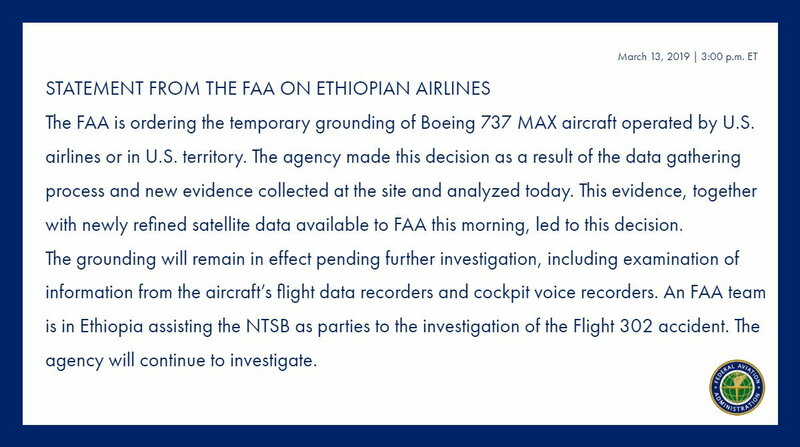 Boeing's latest response..."abundance of caution"
FAA says it is ordering the grounding by US Airlines or in US territory - in response to new evidence gathered at the site and satellite information analysed this morning. UK Channel Islands airspace now closed to 737 MAX ... valuable, since none of our airports are big enough to take the aircraft anyway! For AF447 it was quickly established that airspeed sensors problems were probably responsible for the initial 'upset' and there was a programme to replace that type of (Thales) sensor - presumably successful? For the MAX, Boeing say that the MCAS system only operates when the aircraft is OUTSIDE its 'normal envelope' (or sensors suggest it is). In the recent accidents it seems that faulty AoA sensors caused the a/c computers to think that the a/c were outside of the 'normal envelope' and erroneously invoked MCAS. Seems to me that maybe the AoA sensors should perhaps be more the focus of attention - surely there must be alternative manufacturers for similar sensors? But on your large and congested islands at least you are now safe from the risk of an overflight going wrong. By the way, you call it UK CI airspace, but isn't it pretty much all inside the Brest FIR? 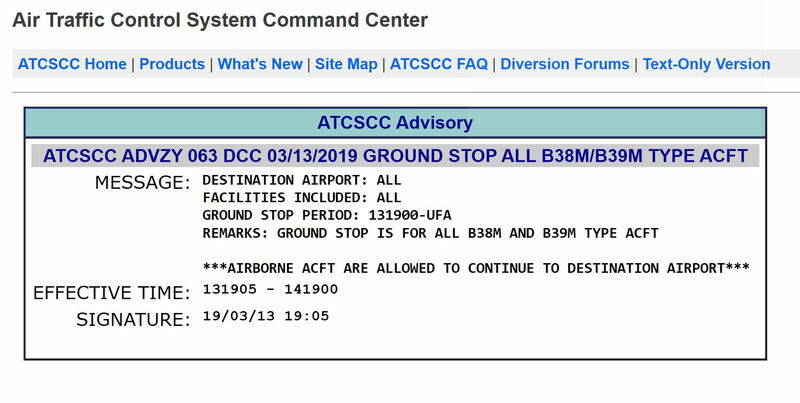 If one presumes the grounded aircraft will be towed to an unused corner of their respective airports rather than taking up valuable space on the apron, or at gates, would preventative preparations be made for an extended grounding? How long can the aircraft be grounded for in a "cold" state without requiring extensive checks and maintenance prior to returning to service? Would the airports be levying a "storage charge"? In terms of Norwegian billing Boeing for the costs that grounding the planes incurs, is that typically something the manufacturer would be on the hook for? In the recent accidents it seems that faulty AoA sensors caused the a/c computers to think that the a/c were outside of the 'normal envelope' and erroneously invoked MCAS. Seems to me that maybe the AoA sensors should perhaps be more the focus of attention - surely there must be alternative manufacturers for similar sensors? It has been mentioned multiple times here that no matter how good a sensor it can fail. E.g. a bird can take it out or something else. The problem seems that it is only dependent on a single sensor which is very dangerous. It should be connected to at least two sensors so if one fails it doesn't send out a false positive signal to aim the plane down to the ground. Instead it would just give a sensor fault message and the flight continues. A computer can only calculate as good as the input it gets. Most planes today have triple redundancy on input. How long can the aircraft be grounded for in a "cold" state without requiring extensive checks and maintenance prior to returning to service? The 787 was grounded for three months in 2013. I assume they will be checked at the same time as the software patch and AoA sensor re-jig is done. If I remember AF447 correctly it was all speculation as there was no data until over a year later when the recorders were recovered. At that time, if my memory serves me right, data showed the flight crew member in the right seat was commanding pitch up with his joystick while the pilot in the left seat was either neutral or pitch down. Basic flaw of joysticks on 2 crew cockpits in that they do not provide input by feel between flight crew. Thales sensors were speculation due to failure history. I keep looking here to see if there is data confirming why Ethiopian crashed similar to the data on Lion Air. Have I missed it? In the case of the Lion Air there was the history of the previous flight where the pilot experienced the same sensor malfunction yet flew to destination. Ethoiopian says the previous flight was normal with no write-ups. It reminds me so much of the AA DC-10 in Chicago where the action was to shoot first and ask questions later with the evidence of what happened lying on the runway. Yes, the DC-10 had many faults resulting from rushing into production but engines falling off wings was not one of them. Engines falling off wings causing the slats to retract was a design flaw. Now the media is interviewing MAX pilots who say they have spent their time as MAX pilots terrified of their life due to control problems. How come they did not say this before? And we have Donald Trump saying airplanes today are too complex for pilots to fly. It just keeps getting worse and worse. Trump has just made the FAA look very very stupid by doing their job for them. It seems Aireon had better data than FR24 and this led to the FAA decision. This is surprising because Aireon update rate is said to be once per minute. You have to wonder if this won’t go down in both the design, and the PR history eff-up books.